And he looks stunning in every shot. His rider will be the envy of the other pony riders. Anyone know what happened to top event rider Boyd Martin at Plantation Fields today? He had a fall and all of his horses were withdrawn. Praying he is ok! No news on Eventing Nation or Twitter or Facebook. Squeaky wrote: Anyone know what happened to top event rider Boyd Martin at Plantation Fields today? He had a fall and all of his horses were withdrawn. Praying he is ok! No news on Eventing Nation or Twitter or Facebook. This was on his Facebook? Glad he will be okay. Just enjoying another day of work at Santa Anita. Is that pony someone notable? Sorry that I don't recognize him, although he is handsome. BaroqueAgain1 wrote: Is that pony someone notable? Sorry that I don't recognize him, although he is handsome. The name on the saddlecloth is a good clue. Sorry, on my monitor I couldn't read the name at first. Had to look closely to find Lava Man. 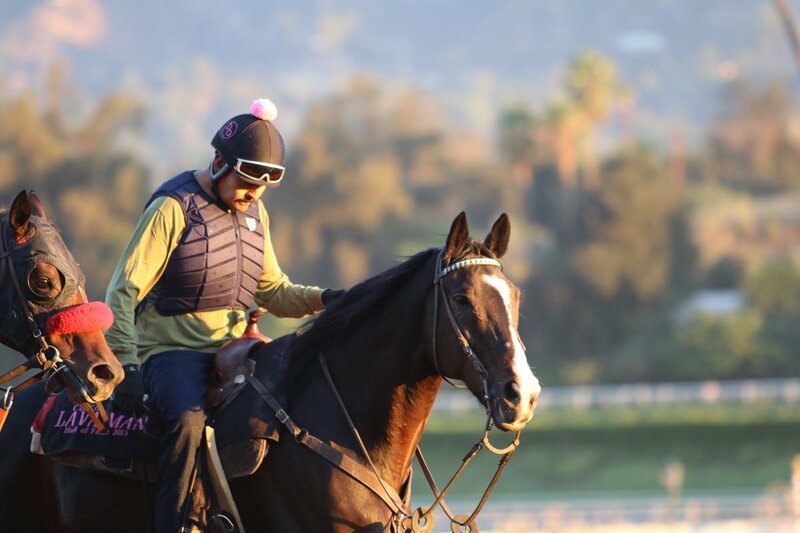 stark wrote: Just enjoying another day of work at Santa Anita. The Coach hard at work. He LOVES Mrs. Fields cookies, and "asks" for them occasionaly on FB. There is a video on Youtube of him helping himself to the feed bin, and he taught another horse to do it as well- cant remember who that was. Moonlight Song, who is being retrained by Buttonwood Farm exercise rider Veronica Wolfe. Up in this video is 9yo Izzy Carpenter, daughter of Buttonwood Manager Jenny Carpenter. According to his new owner he already has offspring competing at the two- and three-star level. She plans to compete him and market him as a stallion. LOL! So is the rider. I really liked him as a 3 yo and found it such a shame when he got injured. He had so much talent. So nice to read an update about him and that he is in good hands!